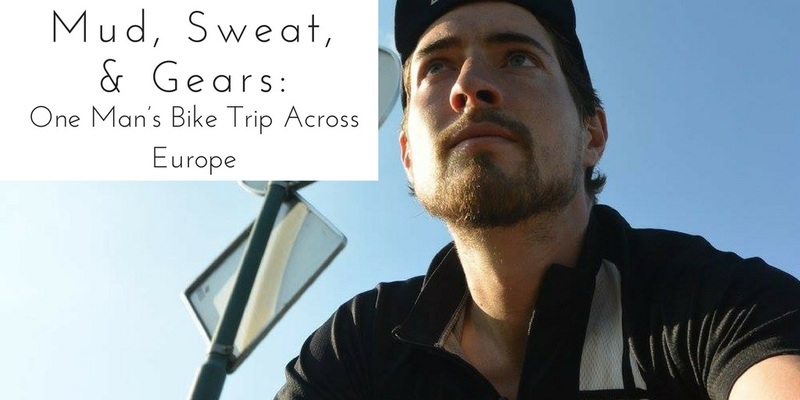 In 2014 Michael Kernan spent 37 days biking across Europe, covering 9 countries and 2400 miles. Along the way he learned some valuable lessons about the world, travel, and himself. Here’s his story. You never know where you’ll find an interesting story. I met Michael last summer while buying a bike in Madison, WI. As seems to often be the case with me, our conversation drifted towards travel. He told me about an epic adventure he’d had a few years back. 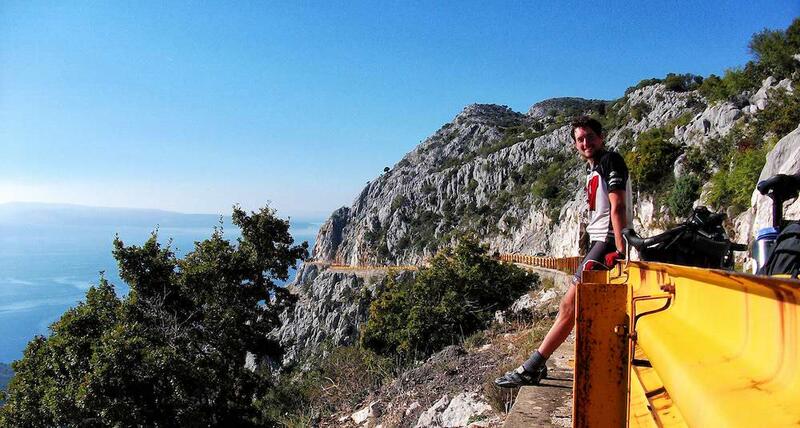 One that took him across Europe—all by bike. Intrigued, I had to learn more so we sat down to chat. Thanks for agreeing to share your story, Michael. It’s easy to get overwhelmed by the sheer scare of a trip like the one you took, but every journey starts with a single step. What was yours? How did this all begin? Thanks for having me. This all began innocently enough. I’d been studying German at the University of Wisconsin - Madison, and found out there was an exchange program for students in Madison’s sister city—Freiburg, Germany. 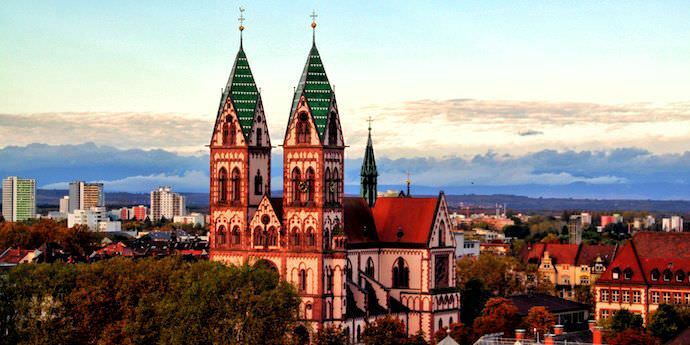 The photogenic skyline of Freiburg, Germany, where Michael started his journey. So instead of graduating on time, I decided to spend a year studying abroad at the Albert- Ludwigs-Universität in Freiburg. The program wasn’t like other study abroad programs, which can sometimes feel like glorified spring breaks. I took classes with the regular students, stayed in the regular dorms, and lived as much as a I could as a local. Had you traveled abroad before or was this your first time? Believe it or not, this was my first time outside of the States. But it was great living in Freiburg. Everyone was really friendly, even if it was a bit challenging at first to speak constantly in German. That definitely took a mental toll on me for a bit. Yet, it really helped me to improve my language skills, which I now use as some side income. I regularly tutor some young children in German. And of course I meet people here in town who are German and we can instantly connect because we share are language and a common understanding of German culture. That’s great! How did the idea of biking across Europe come about? It’s not something most people think about! No, it’s not! 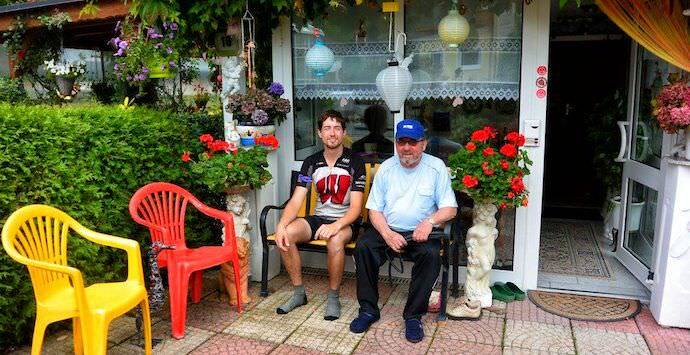 One of my first nights in Germany I met a man at a bar who happened to be a cyclist. We became friends and he took me biking through the Black Forest. 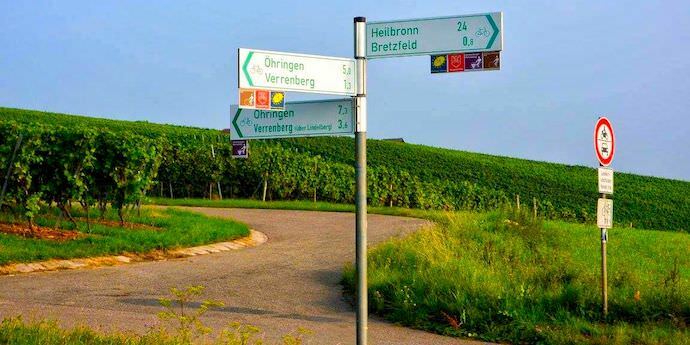 On that trip I saw both how beautiful the German landscape was and how easy it was to get around by bike. Michael on an earlier bike trip through Germany's Black Forest. So when classes finished for the year, I picked out a couple of places I wanted to go to and set out on the road. You make it sound so simple. Was there any more planning involved? Not really. I was already in good physical shape—although I knew that this would be a much more challenging ride than anything I’d ever undertaken before—and packing wasn’t too difficult. 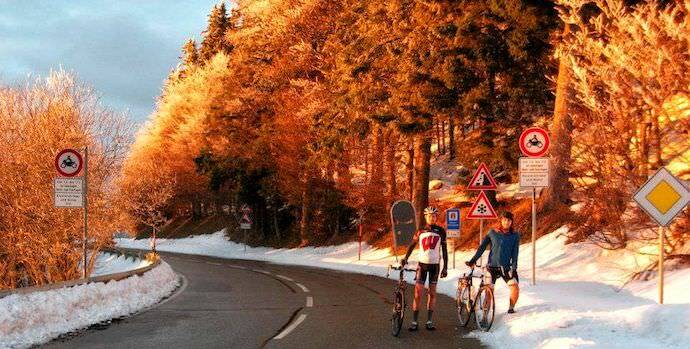 What route did you end up taking? Over the 37 days I went from Germany to the Czech Republic to Austria to Slovenia to Croatia to Bosnia & Herzegovina then back through Croatia to Slovenia to Italy to Switzerland and finally back to Freiburg. What an adventure! How did you know where you were going? Well, I had a few places I knew I wanted to get to like Prague, so I’d look on one of the few road maps I had brought with—no I didn’t use a GPS—and start in that direction, biking until I got too tired or it got too dark. Then I’d check the map again to see what kind of progress I’d made and continue on the next morning. 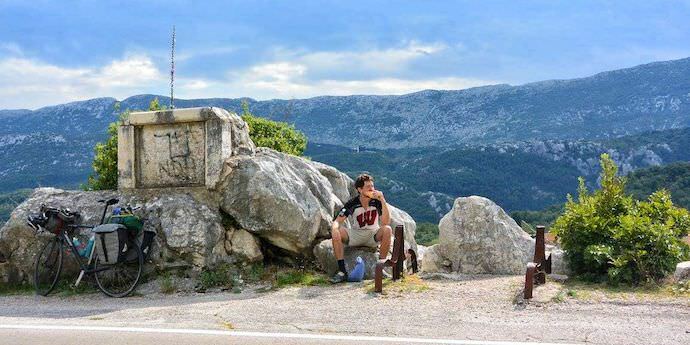 Michael found his way across Europe the old school way—using paper maps and road signs. What exactly did your bring with? Supplies packed on the back of Michael's bike. 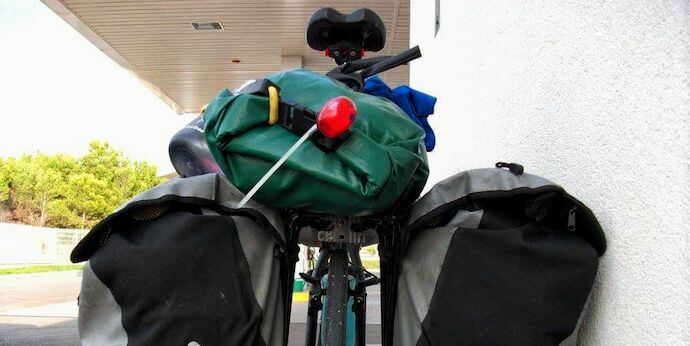 That is packing light, but I’m sure we can all understand why you chose not to haul around a blow dryer or even a pillow! So your plan was to pick up food supplies and camp out at night? Yup. 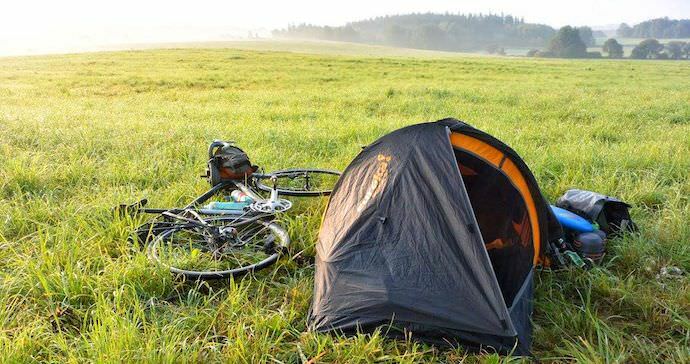 I did spend a few nights in Hostels in Prague, Split, and Sarajevo (it’s hard to camp out in a major city), but other than that I would just bike until it got dark and then find a (hopefully) safe space and pitch my tent. I called it pirate camping! One of Michael's campsites in the Czech Republic. 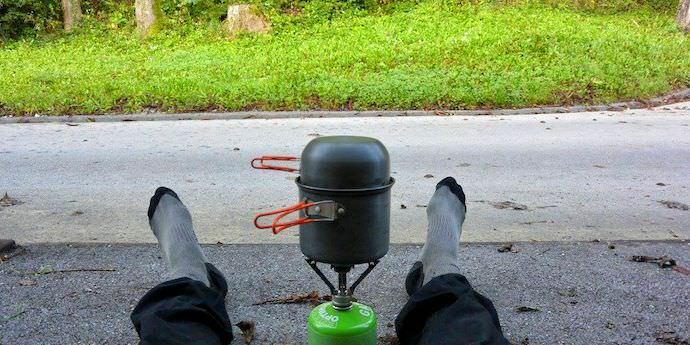 Did you ever have any trouble camping out? No one every really bothered me or told me to leave. In fact, I usually got the opposite reaction. For example, the morning after I’d camped out in Rogatec, Slovenia—right on the Croatian border—I was having a breakfast of leftover rice and vegetables when a man came up to me. At first I was worried he’d yell at me as I’d slept behind a building downtown, but it turns out he was actually the major and I’d slept next to the town hall. Some locals had seen me—and figuring I was in need of a good cleaning up—they invited me to use their bathroom. I left in such a good mood! Michael's view outside the town hall in Leskovec, Slovenia. Was hospitality like this common during your trip? Absolutely—I have so many stories like that! Well another morning I was cleaning up after camping on the German-Czech border (must be something about borders), when I see this German man sputtering up to me. He started asking me some questions about what I was doing. I explained myself and he invited me over to his place for a beer. I’d planned on covering a lot of ground that day, but when someone offers you a beer at 10 AM you can’t say no. 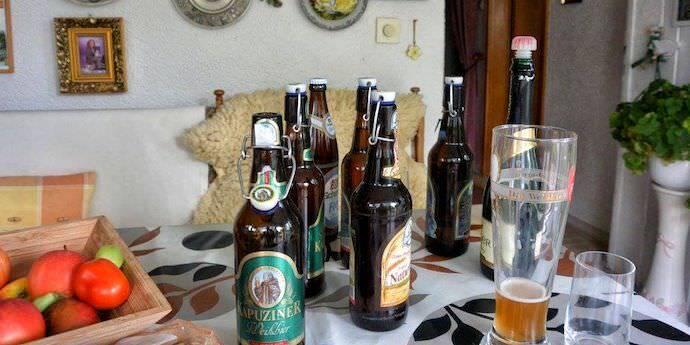 A sampling of some of the beers Michael shared with his new friend, Adolf. So we headed back to his place, and started drinking. About a half hour later—at at point where we were already half in the bag—his wife shows up. You can imagine she was quite surprised to see her husband drunk with a stranger who spoke a strange version of German. But she was really welcoming and cooked us a proper German meal—pork, red cabbage, etc. I didn’t get very far that day by bike, but it was well worth it! Michael with his new drinking buddy. 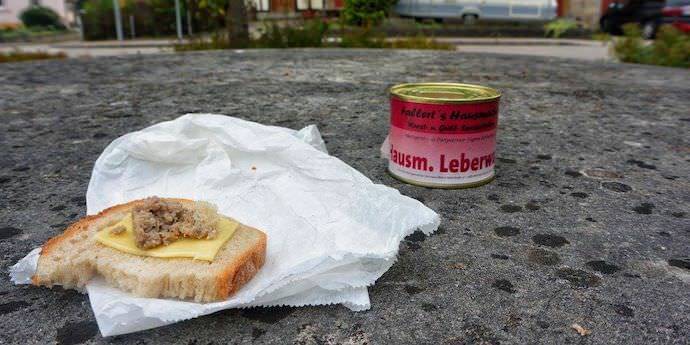 A Czech woman once told me that the Russians ate her cat 40 years prior during the Velvet Revolution in Prague. You never know what you’ll discover when traveling! Did you develop any special techniques to get to know the locals when traveling? I did my best to read body language—to try and figure out who was interested in speaking or not. I also was careful about what I said. It’s amazing how warm people can be to you if you don’t insult their politics or religious beliefs. I imagine that it’s hard to go 37 days on the road without having some setbacks. What was the greatest challenge you faced? Probably the hunger. As you can imagine, all that biking made me quite hungry. And since I didn’t have a ton of cash and was often in the middle of nowhere, I never knew where my next meal would come from. It might not look like much, but meals like this were cherished during Michael's journey. I also had a few problems with the bike along the way. I broke two spokes on my rear wheel while in the Czech Republic. As luck would have it, it was on a Sunday, which meant that everyone was closed. I had no idea what I was going to do. I knocked on a nearby door and explained the situation to the man who answered (via his niece who translated from German to Czech). Somewhat surprisingly, he agreed to help. We attached my bike to his and went two kilometers or so to another man’s house, who answered the door in his underwear. He let us into his back yard, where he had a bike shop and his wife brought us coffee and cookies. He fixed my bike for free and gave me a couple extra spokes. I offered to pay but he refused to accept any money. You certainly met some interesting characters. What was it like doing this trip solo? I thought being alone would be the greatest challenge, but it actually turned out to be a benefit, as it made me more approachable. 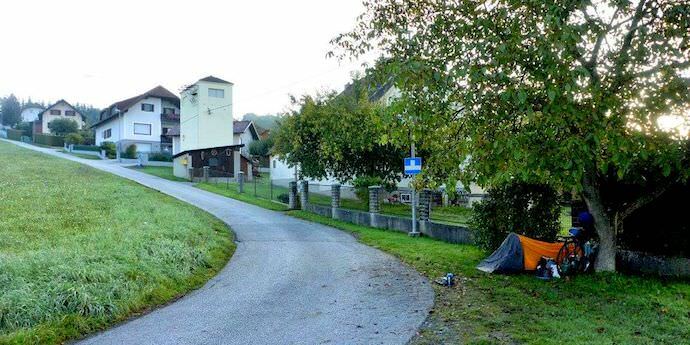 Everyone was curious as to why a solo biker was passing through their small village. Locals would poke their heads out of the windows and ask me where I was coming from and where I was going. And I’d often get invited in for a meal or to clean up when I answered. Michael was often aided by the locals whom he met when passing through small villages such as this one in Austria. 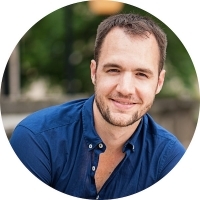 How has that experience with hospitality affected the way you treat others? It gave me a new faith in humanity. None of theses people knew me, and they had no reason to help other than the kindness of their hearts, but they did so. Since this trip, I always try and treat strangers with the same respect and help I received. Michael enjoying a roadside sandwich that he earned in exchange for taking a group photo. What else did you learn during this trip? I learned to be confident. Before this trip I’d always had trouble speaking to crowds or strangers. But as you’ve seen, on the trip I had to talk to strangers just to get by. And eventually I got used to it. Now I speak to people for a living—teaching German, selling bikes, etc. The experiences I had are something that I always carry around with me that I can draw upon whenever I need a bit of confidence our courage. No one can ever take it away from me! I also learned that you don’t need fancy things to be happy. Living with as little as I did for 37 days, I learned that it’s the simple things in life that really matter—a smile, a good conversation, a friendly deed. 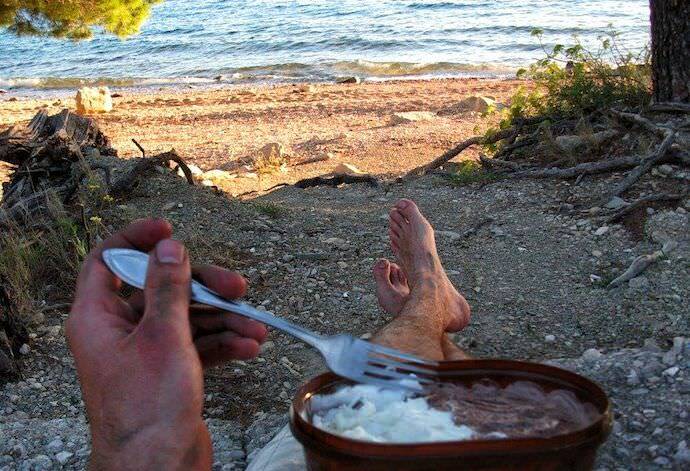 Something as simple as a pint of ice cream while camping out on the coast of Croatia brought Michael so much joy. What would you say to someone who hears your story and is intrigued but feels stuck for whatever reason, whether fear, money, time, etc.? If you have the chance and can find a way to get around those things, then do it. You’ll only regret the things you don’t do. I went into a small amount of debt because I did this study abroad, but I said to myself I could either graduate now and start working or I could graduate one year later and then work. And I realized I’d never be on my death bed saying “I should have started work a year earlier instead of going to Germany!” The experiences made everything worthwhile. The bike trip itself ended up being about $1,500—not bad for 37 days worth of travel. You don’t need luxury to have a good time, especially at a younger age. You can always stay at luxury resorts when you’re older. Live life when you have the chance! 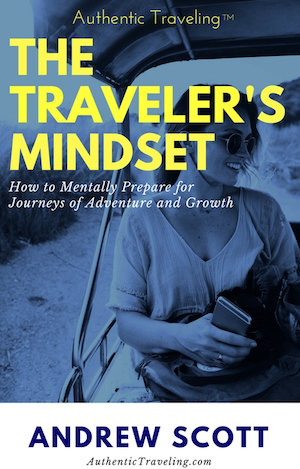 If you're interested in starting your path towards better travel, download my FREE pre-trip boot camp The Traveler’s Mindset: How to Mentally Prepare for Journeys of Adventure and Growth!